ECActiv Solutions used for pre-dip, post-dip, water treatment, calf hutch cleaner, sand separators. 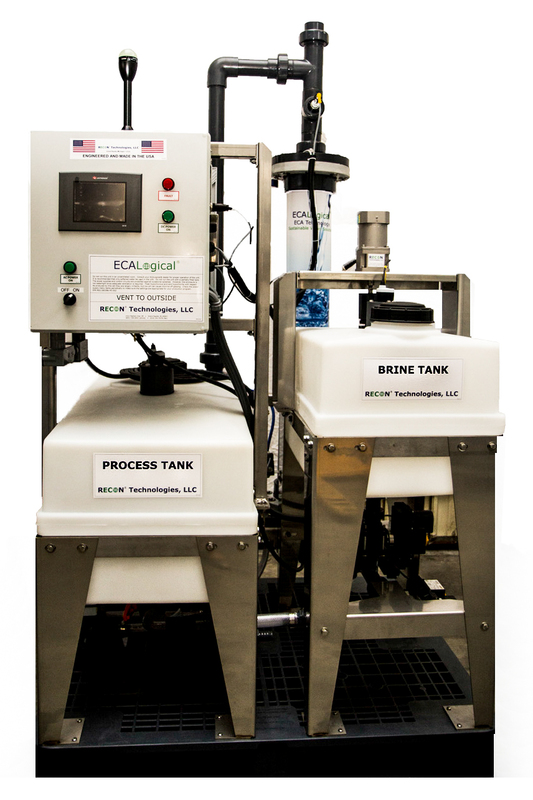 With a Recon ECALogical Generating System you can produce your own ECActiv Cleaning Solution for just pennies per gallon. Teat Dip, Premise Wash, Water Treatment, Calf-Hutch Cleaner, and Drop Hose washing have never been more cost effective. All of our ECALogical Generating Machines are designed, engineered, and built in the USA for reliability and ease of use. With internet based support and control, full warranty and supported with a monthly service plan, you’ll have the best service and product on the market! Our fully automated, PLC controlled machines offer a user-friendly interface that makes it easy to find your way around functions, settings, and information. Designed to be hands off, all you need to do is load in the Brine Additive and press Start. The ECALogical Machine will do the rest! Every farmer is looking for ways to significantly lower there costs. Making your own ECActiv Solutions for pennies on the gallon allows you to cut costs in a number of areas, saving you valuable time and money. Depending on the size of your herd, you can see a significant ROI in as little as a few months. The C100 & C200 ECALogical Generating Machines are built with a focus on longevity and reliability, giving you the peace of mind to focus on other areas of your farm and remain flexible. With over a million hours on 50 + machines in12 states you can’t go wrong! Capacity: 55gal. ECA Concentrate every 14hrs. Capacity: 55gal. ECA Concentrate every 7hrs.